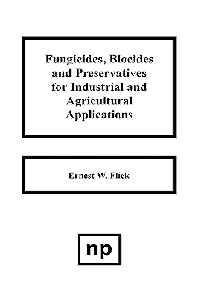 Describes approximately 350 fungicides, biocides, and preservatives that are currently available for industrial and agricultural usage. The book will be of value to industrial and agricultural, technical, and managerial personnel involved in the specification and use of these products. It has been produced from information received from numerous industrial companies and other organizations. Industrial and agricultural, technical, and managerial personnel involved in the specification and use of these products.